ESA today launched another Sentinel satellite. In the PR materials and accordingly also in various media reports Sentinel-3A is generally described as being targeted primarily at ocean observation. More useful is probably to compare it to other existing satellite systems. 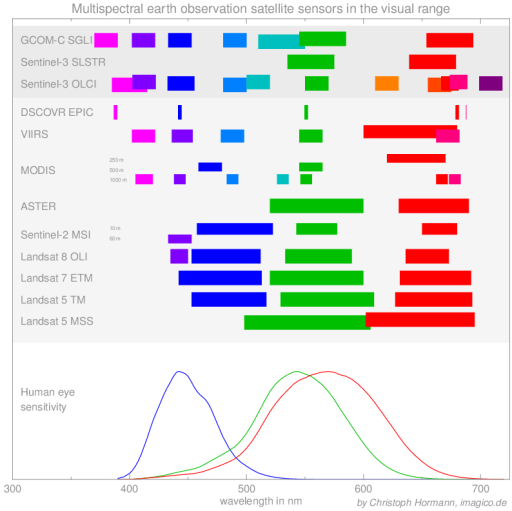 While Sentinel-2 is quite similar to Landsat in both capabilities and mission profile Sentinel-3 can be best compared to the MODIS and VIIRS. The two main Sentinel-3 instruments, the OLCI and SLSTR, record various visible and infrared wavelengths with near-daily coverage of the whole planet with a resolution of 300m/500m. In addition there is a low spatial resolution altimeter primarily for measuring ocean topography. VIIRS provides 375m resolution in some bands and 750m in others, gives true daily global coverage (~3000km field of view) and shows an afternoon timeframe. Sentinel 3 OLCI/SLSTR provides 300m (OLCI) and 500m (SLSTR) resolution, records images every second day near the equator (~1300km field of view, near full daily coverage with two satellites) and covers a morning time frame (both satellites). More important than the formal capabilities is going to be what data products are made available based on these. Published plans indicate that there will only be swath products, i.e. no data resampled into a common coordinate system or composites from several days. But there will apparently be some higher level analytic products indicating atmosphere and surface properties. Somewhat amusing: while Sentinel-1 used GeoTIFF as primary file format and for Sentinel-2 they chose JPEG2000 Sentinel-3 data will apparently come in form of netCDF files – looks to me like a typical European approach to balancing different preferences.